Some functionality is introduced gradually to organizations that have set up the Targeted release option in Office 365. This means that you may not yet see this feature or it may look different than what is described in this article. All users in the organization or only some users or security groups. All sites in the organization or only some sites. Blocking access helps provide security but comes at the cost of usability and productivity. When access is blocked, users will see the following error. Limiting access allows users to remain productive while addressing the risk of accidental data loss on unmanaged devices. When you limit access, users on managed devices will have full access (unless they use one of the browser and operating system combinations listed below). Users on unmanaged devices will have browser-only access with no ability to download, print, or sync files. They also won't be able to access content through apps, including the Microsoft Office desktop apps. When you limit access, you can choose to allow or block editing files in the browser. When web access is limited, users will see the following message at the top of sites. 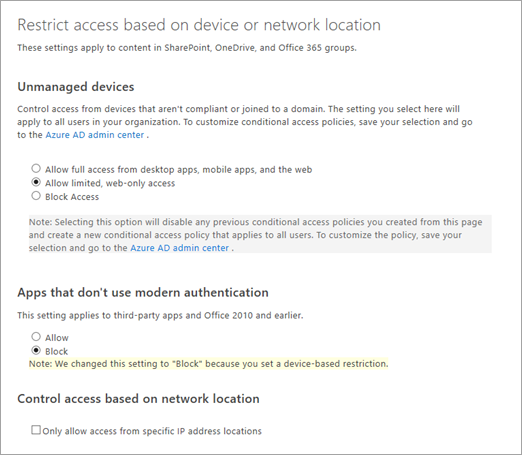 In the left pane of the new SharePoint admin center, select Access control, and then select Unmanaged devices. Select Block access, and then select Save. Go to the Azure AD admin center, and select Azure Active Directory in the left pane. Under Security, select Conditional Access. Select the policy [SharePoint admin center]Use app-enforced Restrictions for browser access. Select Conditions, and then select Client apps. "Browser" should already be selected. Select Mobile apps and desktop clients, select Modern authentication clients and Other clients, and then select Done twice. Make sure that under Session, Use app enforced restrictions appears, and make sure that Enable policy is On. It can take 5-10 minutes for the policy to take effect. It won't take effect for users who are already signed in from unmanaged devices. If you block or limit access from unmanaged devices, we recommend also blocking access from apps that don't use modern authentication. Some third-party apps and versions of Office prior to Office 2013 don't use modern authentication and can't enforce device-based restrictions. This means they allow users to bypass conditional access policies that you configure in Azure. In the new SharePoint admin center, on the Access control page, select Apps that don't use modern authentication, select Block access, and then select Save. In the left pane, under Admin centers, select SharePoint. In the classic SharePoint admin center, select access control in the left pane. In the left pane, select Access control, and then select Unmanaged devices. Select Allow limited, web-only access, and then select Save. Select Allow limited, web-only access. It can take 5-10 minutes for the policies to take effect. They won't take effect for users who are already signed in from unmanaged devices. By default, this policy allows users to view and edit files in their web browser. To change this, see Advanced configurations. 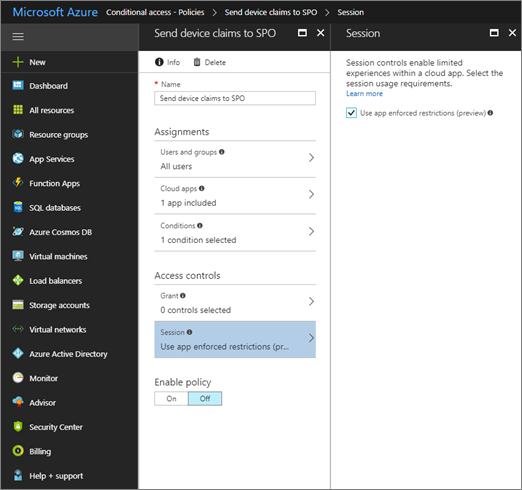 If you go to the Azure AD admin center and slect Conditional access, you can see that two policies were created by the SharePoint admin center. By default, the policy applies to all users. To apply it to only specific security groups, make changes under Users and groups. Be careful not to create multiple conditional access polices in the Azure AD admin center that conflict with each other. 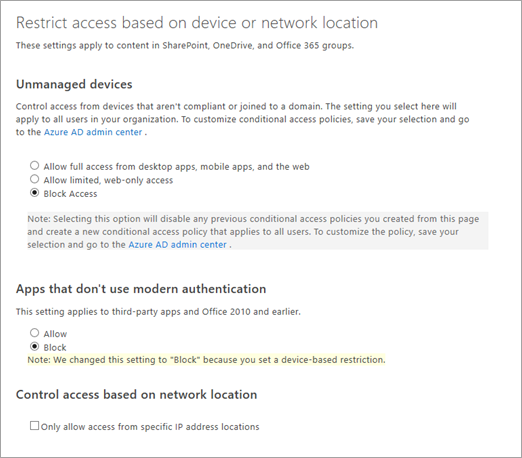 You can disable the policies created by the SharePoint admin center and then manually create the conditional access policies you need. To block or limit access to specific sites, you must set the organization-wide policy to "Allow full access from desktop apps, mobile apps, and the web." Then follow these steps to manually create a policy in the Azure AD admin center and run PowerShell cmdlets. 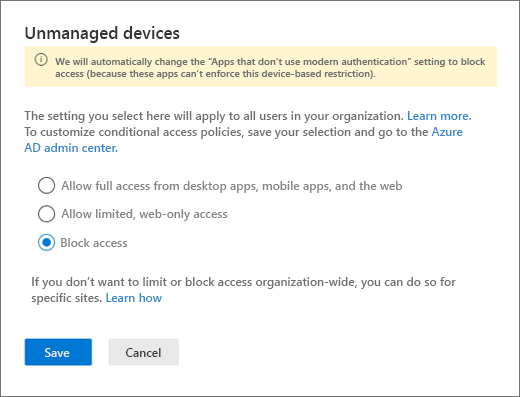 In the Azure AD admin center, select Conditional access, and then select Add. Under Users and groups, select whether you want the policy to apply to all users or only specific security groups. Under Cloud apps, select Office 365 SharePoint Online. Under Conditions, select both Mobile apps and desktop clients and Browser. Under Session, select Use app enforced restrictions. This tells Azure to use the settings you'll specify in SharePoint. Enable the policy and save it. This example gets the OneDrive for every user and passes it as an array to Set-SPOTenant to limit access. The initial comma and the parentheses are required for running this cmdlet as a batch request. The site-level setting must be at least as restrictive as the organization-level setting. -AllowEditing $false Prevents users from editing Office files in the browser and copying and pasting Office file contents out of the browser window. -LimitedAccessFileType OfficeOnlineFilesOnly Allows users to preview only Office files in the browser. This option increases security but may be a barrier to user productivity. -LimitedAccessFileType WebPreviewableFiles (default) Allows users to preview Office files and other file types (such as PDF files and images) in the browser. Note that the contents of file types other than Office files are handled in the browser. This option optimizes for user productivity but offers less security for files that aren't Office files. -LimitedAccessFileType OtherFiles Allows users to download files that can't be previewed, such as .zip and .exe. This option offers less security. The AllowDownlownloadingNonWebViewableFiles parameter has been discontinued. Please use LimitedAccessFileType instead. 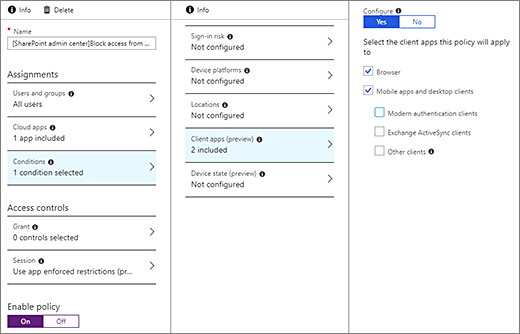 External users will be affected when you use conditional access policies to block or limit access from unmanaged devices. If users have shared items with specific people (who must enter a verification code sent to their email address), you can exempt them from this policy by running the following cmdlet. Anonymous access links (shareable links that don't require sign-in) are not affected by these policies. Anyone who has an anonymous access link to an item will be able to download the item. For all sites where you enable conditional access policies, you should disable anonymous access links. Blocking access and blocking download may impact the user experience in some apps, including some Office apps. We recommend that you turn on the policy for some users and test the experience with the apps used in your organization. In Office, make sure to check the behavior in Flow and PowerApps when your policy is on. Apps that run in "app-only" mode in the service, like antivirus apps and search crawlers, are exempted from the policy. If you're using classic SharePoint site templates, site images may not render correctly. This is because the policy prevents the original image files from being downloaded to the browser.